A major goal of SpaceX has been to develop a rapidly reusable launch system. 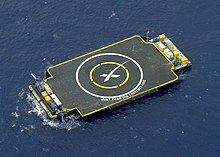 As of March 2013[update], the publicly announced aspects of this technology development effort include an active test campaign of the low-altitude, low-speed Grasshopper vertical takeoff, vertical landing (VTVL) technology demonstrator rocket, and a high-altitude, high-speed Falcon 9 post-mission booster return test campaign. In 2015, SpaceX successfully landed the first orbital rocket stage on December 21. To date, SpaceX has successfully landed 25 boosters: 23 Falcon 9 and 2 Falcon Heavy. 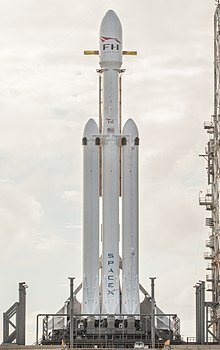 From left to right, Falcon 1, Falcon 9 v1.0, three versions of Falcon 9 v1.1, three versions of Falcon 9 v1.2 (Full Thrust), two versions of Falcon 9 Block 5, and Falcon Heavy. ^ a b Foust, Jeff (2017-11-16). "Shotwell: I was the 7th employee at SpaceX. We're up to about 7,000 now. #NewSpaceEurope". Retrieved 2019-01-13. ^ W.J. Hennigan (2013-06-07). "How I Made It: SpaceX exec Gwynne Shotwell". Los Angeles Times. Retrieved March 1, 2017. ^ a b "Making Life Multi-planetary - RELAYTO/". RELAYTO/. 2018. Retrieved 2018-04-04. ^ "SpaceXNow, Upcoming Missions". Spacexnow.com. Retrieved 22 October 2018. ^ "SpaceX Crew Dragon completes first unmanned flight test". www.indiatvnews.com. 2019-03-09. Retrieved 2019-03-11. ^ Elon Musk on dodging a nervous breakdown. YouTube. 20 April 2015. Retrieved March 1, 2017. ^ "How Steve Jurvetson Saved Elon Musk". Business Insider. 14 September 2012. Retrieved June 4, 2015. ^ Messier, Doug (16 October 2013). "ISPCS Morning Session: Gwynne Shotwell of SpaceX". Retrieved 7 December 2015. Gwynne Shotwell says that SpaceX is now up to about 3,800 employees, counting contractors working for the company. ... 600 more people to hire in next couple months. Finding good software people the hardest skills to fill. ^ de Selding, Peter B. (2017-04-14). "Blue Origin's older than SpaceX in more ways than one". Space Intel Report. Retrieved 2017-04-15. ^ spacexcmsadmin (2012-11-27). "Company". SpaceX. Retrieved 2018-03-29. ^ Irene Klotz (2011-09-27). "A rocket that lifts off — and lands — on launch pad". MSNBC. Retrieved March 1, 2017. ^ Nelson, Laura J. (21 November 2017). "Elon Musk's tunneling company wants to dig through L.A." latimes.com. Retrieved 13 September 2018. ^ "SpaceX has published Elon Musk's presentation about colonizing Mars — here's the full transcript and slides". Business Insider. Retrieved 2018-03-29. ^ "Elon Musk revealed a new plan to colonize Mars with giant reusable spaceships — here are the highlights". Business Insider. Retrieved 2018-03-29. ^ Rory Carroll (17 July 2013). "Elon Musk's mission to Mars". The Guardian. Retrieved 5 February 2014. ^ Douglas Messier (5 February 2014). "Elon Musk Talks ISS Flights, Vladimir Putin and Mars". Parabolic Arc. ^ "Elon Musk Anticipates Third IPO in Three Years With SpaceX". Bloomberg. February 11, 2012. Retrieved March 1, 2017. (Subscription required (help)). ^ Winkler, Rolfe; Pasztor, Andy (2019-04-15). "SpaceX Is Raising $500 Million Amid Internal Questions Over Satellite Internet Business". Wall Street Journal. ISSN 0099-9660. Retrieved 2019-04-15. ^ Colangelo, Anthony. "Farewell, Red Dragon". Main Engine Cut Off. Retrieved 2019-02-01. 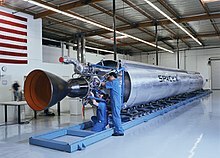 ^ "SpaceX performs first test of Raptor engine". SpaceNews.com. 2016-09-26. Retrieved 2017-04-28. ^ Clark Lindsey (2013-01-04). "NewSpace flights in 2013". NewSpace Watch. Retrieved 2013-01-03. (Subscription required (help)). ^ spacexcmsadmin (2012-11-15). "Falcon Heavy". SpaceX. Retrieved 2017-04-05. ^ "SpaceX delays commercial crew test flights to latter half of 2018 - SpaceNews.com". SpaceNews.com. 2018-01-11. Retrieved 2018-03-29. ^ "Elon Musk's Mars dream hinges on a giant new rocket". Engadget. Retrieved 2018-03-29. ^ "SpaceX signs first private passenger to fly around the moon". Reuters. Retrieved 14 September 2018. ^ "SpaceX reveals mystery moon passenger, and he's a billionaire". CNET. Retrieved 18 September 2018. ^ "SpaceX Upcoming Missions". Spacexnow.com. Retrieved 13 October 2018. ^ "Here's Why Investor Steve Jurvetson Saved Elon Musk's Space Dreams". Business Insider. Retrieved 2018-03-02. ^ Muoio, Danielle (27 January 2017). "Elon Musk's Hyperloop contest is happening this weekend — here's a look at all the competing pods". Business Insider. Retrieved 28 January 2017. ^ Boyle, Alan (27 August 2017). "Germany's WARR team wins SpaceX's Hyperloop II race with 201-mph pod run". GeekWire. US. Retrieved 26 September 2017. ^ "SpaceX Hyperloop website". SpaceX. 10 September 2017. Archived from the original on 10 September 2017. Retrieved 11 September 2017. ^ Berger, Eric (2018-03-19). "SpaceX indicates it will manufacture the BFR rocket in Los Angeles". arsTechnica. Retrieved 2018-03-21. ^ Speck, Emilee (28 June 2017). "Port Authority approves SpaceX hangar for rocket storage". ClickOrlando.com. Retrieved 11 May 2018. ^ a b Ralph, Eric (24 December 2018). "SpaceX CEO Elon Musk: Starship prototype to have 3 Raptors and "mirror finish"". Teslarati. Retrieved 24 December 2018. ^ a b Foust, Jeff (24 December 2018). "Musk teases new details about redesigned next-generation launch system". 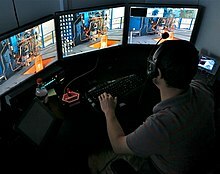 SpaceNews. Retrieved 13 January 2019. ^ Murphy, Mike (10 January 2019). "Elon Musk shows off SpaceX's massive Starship test rocket". MarketWatch. Retrieved 12 January 2019. ^ Granath, Bob (2015-03-24). "NASA, SpaceX Sign Property Agreement for Historic Launch Pad". NASA. Retrieved 2018-03-29. ^ "NASA, Partners Update Commercial Crew Launch Dates – Commercial Crew Program". blogs.nasa.gov. Retrieved 2019-02-11. ^ "SpaceX adds a big new lab to its satellite development operation in Seattle area". GeekWire. 2017-01-27. Retrieved 2018-10-11. 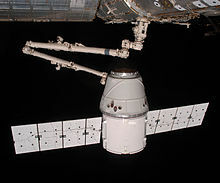 ^ "NASA awards SpaceX with crew missions to International Space Station". www.teslarati.com. Retrieved 2018-03-29. ^ "ULA, SpaceX secure nearly $650 million in Air Force launch contracts". Florida Today. Retrieved 2018-03-29. ^ "Air Force budget reveals how much SpaceX undercuts launch prices". Ars Technica. Retrieved 2018-03-29. ^ spacexcmsadmin (2012-11-27). "Capabilities & Services". SpaceX. Retrieved 2018-03-29. ^ Wattles, Jackie (11 January 2019). "SpaceX to lay off 10% of its workers". CNN.